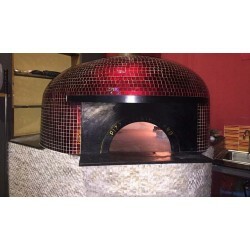 Professional ovens are built for professional baking, such as pizzerias, restaurants, guest houses or bars. They are designed for wood direct cooking or can be equipped with one of the gas systems that you may found in the "optional" category. To meet all the needs they have different internal diameters to ensure the required quantities. In addition to high quality of baking, our professional ovens can be characterized externally to make them in line with the public style of the environment in which they are placed: you may found these coatings always in the "optional" category. PROFESSIONAL OVENS There is 1 product.